John Peskind is an associate attorney at Illinois Advocates, LLC. At Illinois Advocates, John primarily practices civil litigation with a focus on consumer litigation and tenants’ rights law. John earned his degree in Philosophy and Political Science from Bradley University in 2013. 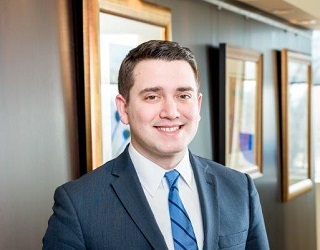 In 2016, John earned his Juris Doctorate from DePaul University College of Law, where he attended as a Dean’s Scholarship recipient. Prior to joining Illinois Advocates, John practiced at a domestic litigation firm where he was able to refine his skills as a keen negotiator and formidable courtroom advocate. He has also successfully briefed and argued complex and novel issues before the Appellate Court of the State of Illinois. John understands that his clients are sometimes overwhelmed by the complexities of the legal process. He works diligently with his clients to ensure that they are always up-to-date on their matter and ensures that they understand each step of the process.